Spectre PS aerosol insecticide contains 0.5% Chlorfenapyr and is classified as a non-repellent. As a non-repellent insecticide, the insects cannot detect its presence, allowing the insects to cross over its chemical placements, instead of avoiding the area. Spectre PS is not just for bed bugs or roaches, it is also useful for silverfish, wasps, ants, and other ocassional invaders. 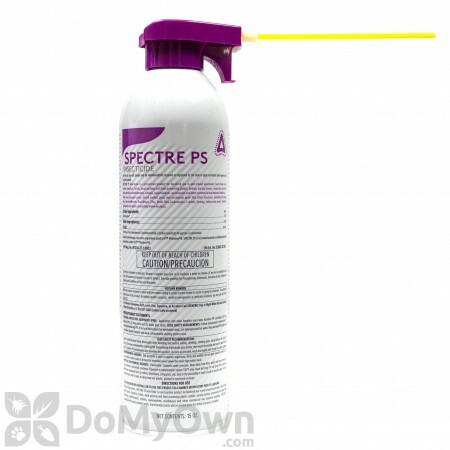 Use the supplied actuator and injection tubes to apply Spectre PS Insecticide. Inject into cracks and crevices or void spaces where pests may be hiding, living and breeding. After placing the injector tip into cracks, crevices, holes and other small openings, release approximately 1 sec of Spectre PS Insecticide. For light infestations, move injector tip along cracks and crevices or void spaces while treating at the rate of 3 Linear ft/sec. For heavy infestations, move the injector tip along at 1 Linear ft/sec. For closed voids, figure the cubic area of the void and apply Spectre PS Insecticide at 1 to 5 sec/3ft3 . Several holes may be required in long running voids. Use the supplied actuator and injection tubes to apply Spectre PS Insecticide. 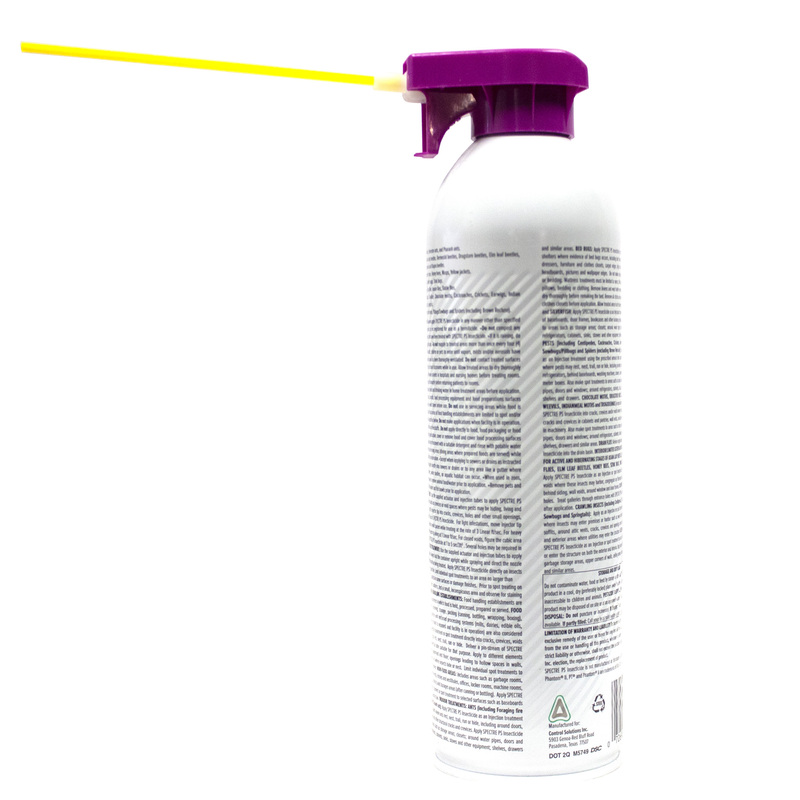 Always hold the container upright while spraying and direct the nozzle about 12 inches from the surface being treated. Apply Spectre PS Insecticide directly on insects in these locations when possible. Limit individual spot treatments to an area no larger than 2 ft. Spectre PS could stain some surfaces or damage finishes. Prior to spot treating on plastic, painted or varnished surfaces, test a small, inconspicuous area and observe for staining or damage to finish. Food handling establishments are places other than private residences in which food is held, processed, prepared or served. Includes areas for receiving, storage, packing (canning, bottling, wrapping, boxing), preparing edible waste storage and enclosed processing systems (mills, dairies, edible oils, syrups). Serving areas (when food is exposed and facility is in operation) are also considered food areas. Apply as an Injection treatment or spot treatment directly into cracks, crevices, voids or onto surfaces where pests rest, nest, trail, run or hide. Deliver a pin-stream of Spectre PS Insecticide through an injection tube suitable for that purpose. Apply to different elements of construction; between equipment and floor; openings leading to hollow spaces in walls, equipment legs and bases; and where insects hide or nest. Limit individual spot treatments to an area no larger than 2 sq. ft. per room. Includes areas such as garbage rooms, lavatories, floor drains (to sewers), entries and vestibules, offices, locker rooms, machine rooms, boiler rooms, garages, mop closets and storages areas (after canning or bottling). Apply Spectre PS Insecticide as an Injection treatment or spot treatment to selected surfaces such as baseboards and under elements of construction. Apply Spectre PS Insecticide as an Injection treatment into cracks, crevices and voids where ants rest, nest, trail, run or hide, including around doors, window frames, wall voids and other structural cracks and crevices. 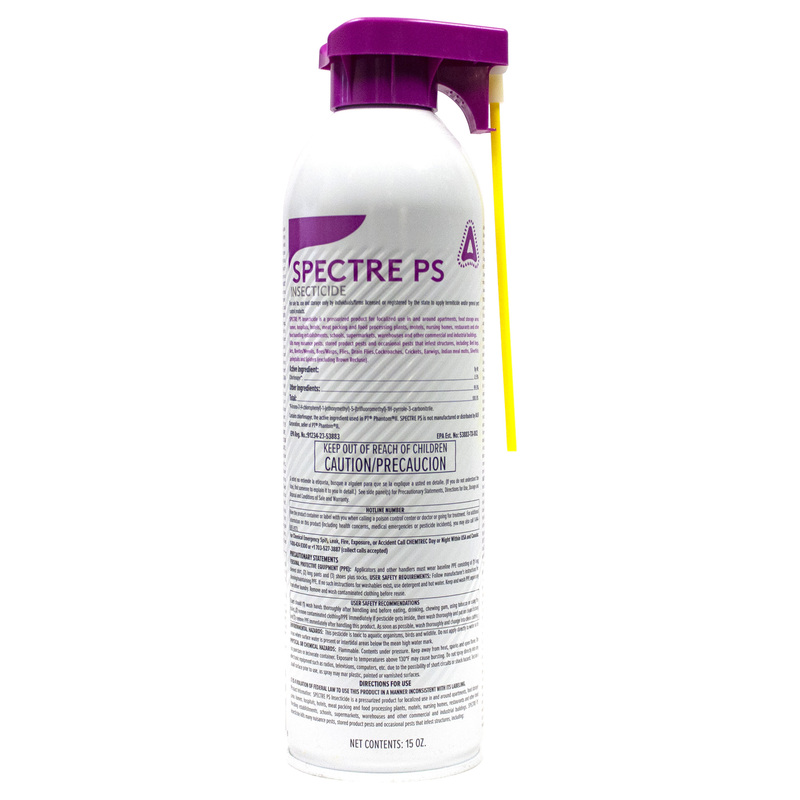 Apply Spectre PS Insecticide as spot treatments to areas such as storage areas; closets; around water pipes, doors and windows; around refrigerators, cabinets, sinks, stoves and other equipment; shelves, drawers and similar areas. Apply Spectre PS Insecticide to cracks, crevices, voids and/or shelters where evidence of bed bugs occurs, including bed frames, box springs, inside empty dressers, furniture and clothes closets, carpet edges, high and low wall moldings, behind headboards, pictures and wallpaper edges. Do not make surface applications to mattresses or bedding. Mattress treatments must be limited to seams, folds and edges only. Do not treat pillows, bedding or clothing. Remove linens and wash before reuse. Allow treated mattress to dry thoroughly before remaking the bed. Remove all clothes and other articles from dressers or clothes closets before application. Allow treated areas to dry thoroughly before use. Apply Spectre PS Insecticide as an Injection treatment into cracks and crevices of baseboards, door frames, bookcases and other harborage sites. Also make spot treatments to areas such as storage areas; closets; around water pipes, doors and windows; around refrigerators, cabinets, sinks, stoves and other equipment; shelves and drawers. Apply Spectre PS Insecticide as an Injection treatment using the prescribed amount into cracks, crevices and void spaces where pests may rest, nest, trail, run or hide, including openings around pipes and sinks, under refrigerators, behind baseboards, washing machines, stoves, cabinets, sewers, floors drains and meter boxes. Also make spot treatments to areas such as storage areas; closets; around water pipes, doors and windows; around refrigerators, cabinets, sinks, stoves and other equipment; shelves and drawers. Apply Spectre PS Insecticide into cracks, crevices and/or voids where these pests may harbor such as cracks and crevices in cabinets and pantries, wall voids, around window and door frames, and in machinery. Also make spot treatments to areas such as storage areas; closets; around water pipes, doors and windows; around refrigerators, cabinets, sinks, stoves and other equipment; shelves, drawers and similar areas. Release approximately 1 to 2 sec of Spectre PS Insecticide into the drain basin. Apply Spectre PS Insecticide as an Injection or spot treatment into cracks, crevices and/or voids where these insects may harbor, congregate or hibernate such as cracks and crevices, behind siding, wall voids, around window and door frames. Locate entrance holes. Treat galleries through entrance holes with Spectre PS Insecticide. Seal bee entrances after application. 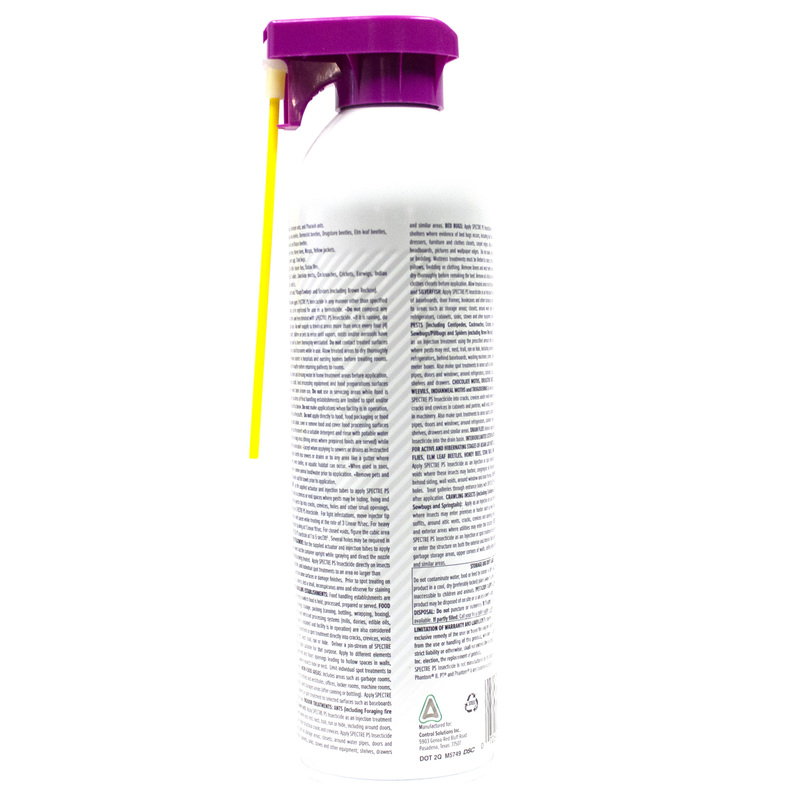 Apply as an Injection or spot treatment into cracks and crevices where insects may enter premises or harbor such as weep holes, under siding, wall voids, soffits, around attic vents, cracks, crevices and openings around windows doors and pipes, and exterior areas where utilities may enter the structure. Apply Spectre PS Insecticide as an Injection or spot treatment to areas where flies rest, congregate or enter the structure on both the exterior and interior. Apply around doors, windows, garages, garbage storage areas, upper corners of walls, ceiling areas, around sky lights, light fixtures and similar areas. Is Spectre PS a residual kill product or is it only a contact kill product? Spectre PS has approximately a 4 week residual.